We’re excited to announce the second game in The Jackbox Party Pack 2: Bomb Corp! You and your friends are interns at Bomb Corp. where you will need to work together to make coffee, do some light filing, and, oh yeah, keep bombs from exploding. Each player receives different instructions on their phones and needs to share information to complete the task correctly. If not, you’ll get a bad performance review. Also, you’ll blow up and die. Man. I don’t even know how to explain this game. Just play it. Oh. You can’t. It’s not out yet. Crap. There are two modes: “The Job,” a story mode where you progress through several weeks of work at Bomb Corp. and “The Grind” for those who hate stories and just want to play the puzzles. Fibbage 2, Bomb Corp. and three other games will be part of the The Jackbox Party Pack 2 on PS3, PS4, Xbox One, Steam and probably a bunch of other devices coming this fall. Let’s see. Where does that leave us with the party pack now? I’m intrigued! Can’t wait to see it in action. I hope they make bomb corp a stand-alone download like Quiplash! Is there an end to Bomb Corp, or does it go forever? I am on “Sick Day”. 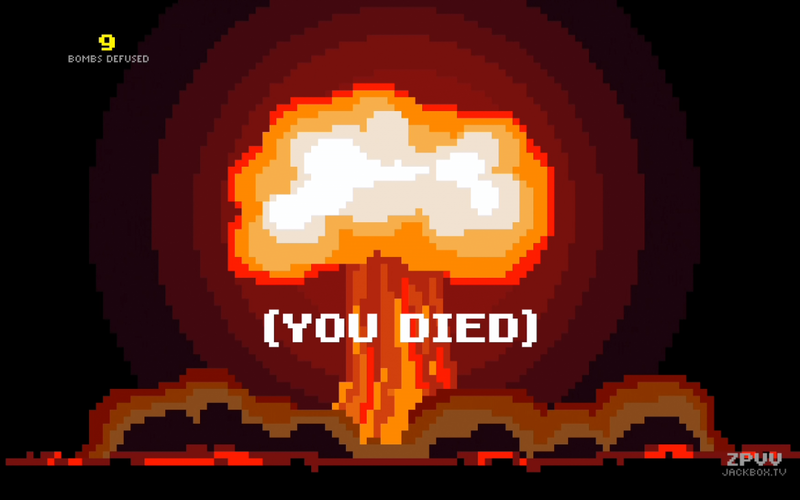 Oh You Died Bomb Corp! i am concerned because i just purchased The Jackbox Party Pack for Xbox 360, and i am now seeing that it is online only. i need to know how long i can expect the online servers to support this game, because i keep/play my games for years. i still have games from ’05 that i play. if this is not the case with this game then i need to return this product asap. Here is the actually truth about Bomb Corp. It only has 12 Days and in Day 12, the keypad puzzle is mistranslated and unsolvable due to an update glitch. It’s true. I’m not lying. Jackbox Games is responsible for this glitch. You need to be a mathematician to get the secret achievement for Bomb Corp. If you are not a mathematic, then you’re too stupid to complete The Job in Bomb Corp. Nobody can do it.